Isn't she a beautiful little girl! Brett calls her Madame Lash but her name is Kitten, not very original I know but, when I got her about 15 years ago I couldn't decide on a name and kept calling her Kitten with the intentions of giving her a beautiful name and of course it never happened, so, please let me introduce to you our beautiful girl Kitten. The blinds were casting beautiful shadows over her and I couldn't resist taking her picture. She is very pretty, and made even more interesting with those shadows. After reading your profile, you sounded so much like me in my younger days, trying to be green in such an uncaring world. Trying to raise families and be the person you love and just watching the chickens...I miss mine so much, I must have them again in the spring. I also miss having cats...but Miss Scratchy will not allow it, a tenacious terrier, I fear for the cat(victim of attacks). Beautiful cat, with shadows. Regarding the name, I recently met a woman whose dog is 11 and it's name is Puppy. See, you're not alone. Oohh! 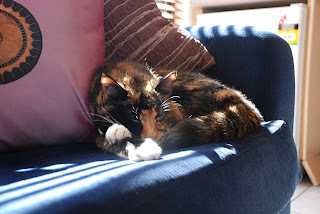 Kitty is adorable and does look so compfortable sleeping with the sun shining in on her! The shadows are so neat casting over her! I could so take a nap on that couch! Oh, lovely photo - clever cat to seek out that gorgeous cosy little corner to have a nap! And the streaming sunlight across her soft fur is beautifully captured. Kitty looks so comfortable with the shadows covering her like a blanket. I prefer Madame Lash, though!